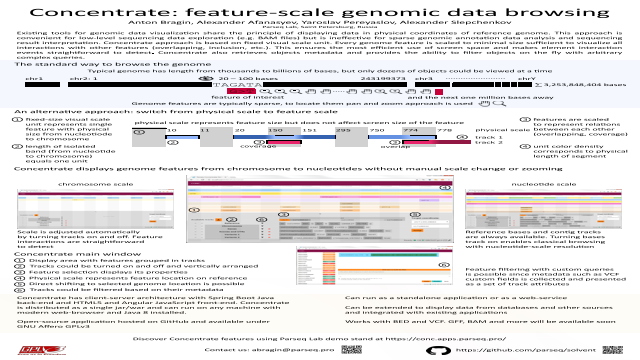 Abstract: Existing tools for genomic data visualization (UCSC Genome Browser, Ensembl Genome Browser, IGV, etc.) share the principle of displaying data in physical coordinates of reference genome providing user with pan and zoom controls for navigation. This approach is convenient for low-level sequencing data exploration (e.g. BAM files) but is ineffective for sparse genomic annotation data analysis and sequencing result interpretation where presence and number of features or feature relations is more important than physical size and exact location. In Concentrate we implement a novel approach to genomic data visualization that is based on fixed visual scale unit. Every displayed object (annotation feature, genetic variant, etc.) is scaled to have minimal possible size sufficient to visualize all interactions (overlapping, inclusion, etc.) with other objects, so any isolated element equals one unit and every interaction site increases element size by one. This ensures the most efficient use of screen space and makes element interaction events straightforward to detect. Base-pair scale is displayed in parallel to provide information on objects physical size. Concentrate also retrieves objects metadata and provides the ability to filter objects on the fly with arbitrary complex queries omitting the necessity to use external tools and reload processed dataset into the browser.